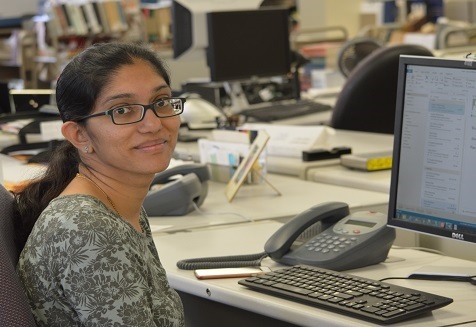 Sravanthi (Sravs) Adusumilli , a graduate of Acharya Nagarjuna University, Guntar, India, joined the Library Technology Development team in August. She reports to Demian Kratz, team leader. She is currently working on redesigning “Finding Augustine.” “Finding Augustine” is “[a] rich and readily accessible biographical collection concerning Augustine of Hippo and his legacy;” it is sponsored by the Augustinian Institute at Villanova University. Adusumilli has a bachelor’s degree in computer science engineering and is now enrolled in the Master of Science in Computer Engineering program with an anticipated graduation in May 2018. She plans to work as a data scientist. Her hometown is Machilipatnam, India, a city on the southeast coast. Adusumilli’s hobbies are cooking and gardening.